USA version originally issued with catalog # PE 34188, per Billboard Magazine. Reissue with catalog # JE 34188 appeared in October, 1977. Picked up a NM copy and it's a remarkably good pressing, I would be surprised if anyone came back with a negative review on tis one. These have a bar code sticker on the plastic wrap over the bar code on the back cover. Order form for these say Red Vinyl and no where does it say colored vinyl on the cover. Only a RTI pressing sticker on front. I aven't opened mine yet to inspect. One can go down the list of grand accomplishments of this Band, I won't do so here! I will say this . . . some Bands strive to beat their last albums sales no matter what, and rightly so! But, for some unknown reason, Boston gave the world there best and most outstanding production with the release of their first album "Boston" !!! I won't say anything about their other albums here but . . . to me . . . this one album defined them as a Band and is by far the very best of Boston!!! I purchase mine at Amazon UK and there is a noticable level of sibilance mainly in A side. i rarely face this issue with my setup (Rega P3 with AudioTechnica AT150MLX). May I got a defective record? Perhaps every ten years or so, I find myself holding this album, an album that swept the nation, by a band named after a city that was dropped on America like a bomb just in time for this country’s bicentennial. Truth be told, there was no actual band, the album was nearly the solo project of M.I.T. (hence the name Boston) graduate student Tom Scholz, recorded in his home studio in Massachusetts. Tom laid this album out like any grad student would who was working of a thesis or doctoral project, experimenting with sounds, developing songs, arranging hooks and testing out soloing that would be perfect for a nation filled with proficient air-guitar players. Scholz relied heavily on what rose to the top of the rock charts for style and context, all while developing a fusion of hard but smooth edged rock with motifs that were delicate, arranged in layers that overlapped and wove with the melodies, leading to complex sonic harmonies, venturing down the same avenues as of course Led Zeppelin, The James Gang, Jimi Hendrix and The Who. The album Boston was perhaps the most calculated musical project in history, one of epic proportions, yet even Scholz wasn’t prepared for ride he was about to take with a grouping of musicians who were as handpicked for their looks and abilities as were the notes that would propel them into the stratosphere and beyond during that summer in 1976. During these years, vinyl was the preferred choice for music consumption, though cassette tapes surely offered superior sound and cost far more to produce than records, yet sold for far less … an aspect that I’ve never understood. Nevertheless, when laying down the tracking for an album, artists were restricted to twenty to twenty-five minutes per side, and thus needed to consider each side of an album as a whole, with songs that would lead in and out of said side, though together, delivering something that was contextually laid out as in a story line. To that end, I’ve always thought that Boston got the siding mixed up, that side two should have begun the album, followed by side one, which is actually how I recorded it to cassette tape, where the earth shattering song “Long Time” would have closed the album, leaving fans even more transfixed and breathless. Yes, the sound was fresh and new, yet it was instantly dubbed as ‘corporate rock,’ meaning those who enjoyed their snob appeal and self-righteousness, quickly pretended that they hadn’t purchased the record. Directly due to Boston, there was a shaking of the foundations of what was called FM ‘progressive radio’ during those days, with more working class stations arriving, stations who supported acts such as Boston, Van Halen, Journey, Aerosmith, Black Sabbath and other like minded bands. Yet even so, Boston stood out as something alone in the field of rock n’ roll with an album that had been labored over for so long, an album nearly fabricated to draw listeners in, sweep them off their feet and leave them smiling. As to this attitude, I’ve forever wondered why Boston was considered ‘corporate rock,’ yet Steely Dan, who did much the same thing, tweaking until perfection could not be denied was not. Of course, the album sold millions of copies, and while their 1978 followup Don’t Look Back, an album with a more than prophetic title, implying, don’t look back at our first album and make comparisons, because while Don’t Look Back still soared into the platinum realm, it wasn’t that good, it didn’t measure up. How could it, Don’t Look Back wasn’t given birth after six years of polishing, laying down single notes that would string together one at a time to form blistering chords that would captivate, hypnotize and intoxicate. What Boston was doing was something we’d come to expect from say Pink Floyd, but Floyd were entirely hip, what Boston were doing was bubblegum, it was heavy, it was light, it suited FM, AM, and for that reason came off as pretentious and easily dismissed. The album was also more than the sum of the musicians who recorded it, the record was a fabrication of the studio, where the tape machine, the console, the EQ’s and gear were every bit as important as were the vocals, the drums and the guitars, all brought together by skilled hands and not by chance as Scholz wove and structured extraordinary riffs, brilliant slight of hand emotion, songs that were sensual, sensitive, and in the same breath muscular, where I’d love to say that Boston is one of the greatest records ever put to wax … but I’m one of those wrapped up in my own pretenses, and for that reason, simply holding this record and remembering those stoned nights, where weed had actual names and frisbees glowed in the dark is quite enough me for me now. 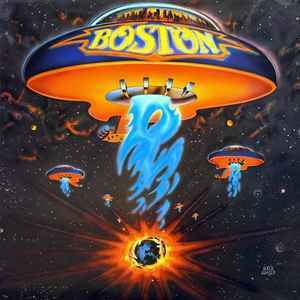 Boston is truly everything that was wrong and everything that was right about the first half of the 1970’s, and album for many that was ecstatic, a great deal of fun, holy, deeply listenable, lovable, timeless, and most importantly, never to be truly imitated ever gain. Perhaps one day, when no one’s around, I’ll drop this gem onto my platter and give it a spin. My pressing is not to bright and outstanding. Worth owning for sure. Very good pressing indeed sounds dynamic and clean highly recommended. Prensagem maravilhosa. Limpa, equilíbrio sonoro e uma doçura inexplicável. Um disco extraordinário numa versão sensacional.